The first compilation of the riveting and provocative interviews of Punk Planet magazine, founded in 1994 and charging unbowed into the new millennium. Never lapsing into hapless nostalgia, these conversations with figures as diverse as Jello Biafra, Kathleen Hanna, Noam Chomsky, Henry Rollins, Sleater-Kinney, Ian MacKaye, and many more provide a unique perspective into American punk rock and all that it has inspired (and confounded). Not limited to conversations with musicians, the book includes vital interviews with political organizers, punk entrepreneurs, designers, film-makers, writers, illustrators, and artists of many different media. The Expanded Edition is updated with 6 more interviews and a new introduction, bringing the definitive book of conversations with the underground's greatest minds up to 2007. New interviews include talks with bands like The Gossip and Maritime, a conversation with punk legend Bob Mould, and more. 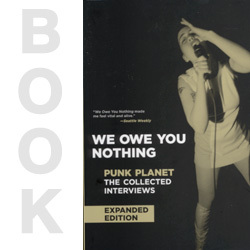 Punk Planet has consistently explored the crossover of punk with activism, and reflects the currents of the underground while simultaneously challenging the bleak centrism of today's popular American culture.